There are picture postcards of virtually every community in the country, however small. In some cases they provide the only photographic documentation of a place. Many older views have become scarce and command high prices from collectors. The six Gravesend scenes below were published between 1907 and 1911 by “F. Johnson,” who was very likely Frederick Van Kleek Johnson (1875-1930), keeper of a general store. It’s hard to imagine such a countrified institution existing in Brooklyn, but Gravesend remained a quiet, rural neighborhood into the 20th century, as these postcards attest. You may have seen some of them separately, but here’s the complete set. Frederick Van Kleek Johnson’s general store occupied the building at the left in this view of Village Road North looking east from Van Sicklen Street towards McDonald Avenue. It stood where Lady Moody Triangle is today. The street names “Village Road North,” “Village Road East,” and “Village Road South,” were not set in stone early on; they were often lumped together under the directionless “Village Road.” Today’s Village Road North was once called “Ryder Place” for the many Ryder family members who lived there. Gravesend’s last town hall, at 2337 McDonald Avenue (southeast corner of Gravesend Neck Road), went up in 1873. The building held an auditorium on the second floor, a courtroom on ground level, and four basement jail cells. After the City of Brooklyn annexed Gravesend in 1894, the structure housed the predecessor of Fire Engine Company 254. It was demolished in 1913. This small wooden chapel at 14 Gravesend Neck Road began life as the Sunday School / lecture room of the Gravesend Reformed Dutch Church (GRDC). It was built about 1854 near the northwest corner of McDonald Avenue and Gravesend Neck Road, just south of the 1834 sanctuary of the GRDC. When the congregation moved to 121 Gravesend Neck Road in 1893/94, it took the lecture room to the new site to house services while the new church was under construction. In 1899 the little building was sold for one dollar to the fledgling Gravesend Methodist Episcopal Church (GMEC) and moved — for the second time — to the southeast corner of Gravesend Neck Road and Van Sicklen Street. After the GMEC disbanded in 1914, the building housed the Coney Island Pentecostal Church, which replaced it in 1937 with the current stone structure on the site. The latter building is now the First Korean Church of Brooklyn. Gravesend’s first school opened in 1728 near the southeast corner of McDonald Avenue and Gravesend Neck Road. In 1838 it moved to the east side of Van Sicklen Street, north of Gravesend Neck Road, and has remained there, in changing buildings, ever since, eventually coming to be called P.S. 95. The 1888 schoolhouse seen here stood opposite Lama Court, just beside the modern (1915) brick structure of P.S. 95 (at 345 Van Sicklen Street). It survived until a 1939 addition to the newer building forced its demolition. The first mass of the Roman Catholic parish of Ss. Simon and Jude was celebrated in a barbershop at 321 Avenue T on Christmas Day, 1897. In 1898 the cornerstone for a permanent church was laid at the northeast corner of Van Sicklen Street and Avenue T. That sanctuary was consecrated in 1899. The current church went up in 1966 on the site of the adjacent rectory (northwest corner of Avenue T and Lake Street), and the old building was demolished for a parking lot after the new one was dedicated in 1967. Those of us who frequent cemeteries know that stones with a common surname, standing near each other, usually mark the graves of family members. If the stones bear close or identical dates of death, the implication is that contagion carried off multiple relatives, as it did for eons before the advent of standardized sanitation and medical care. 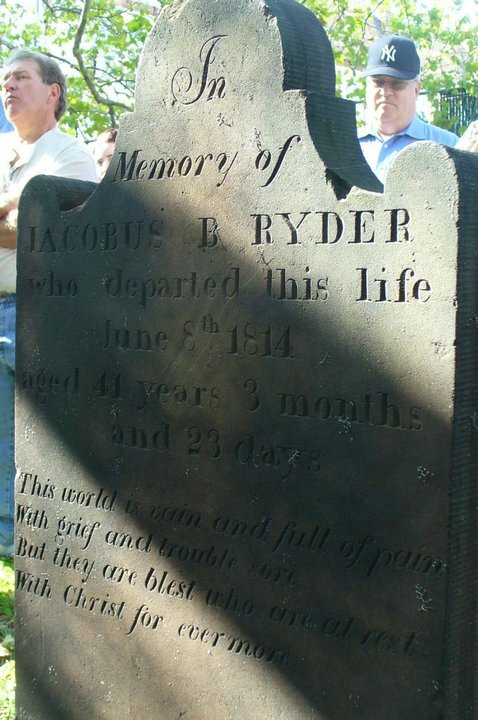 One might assume that because they died ten days apart, Barnardus and Jacobus (pronounced ya-CO-bus) Ryder succumbed to the same disease. The Gravesend Cemetery is peppered with other chronologically adjacent burials, like the five members of the Van Sicklen family who died of cholera between August 18 and 23, 1849 (see the article at left). 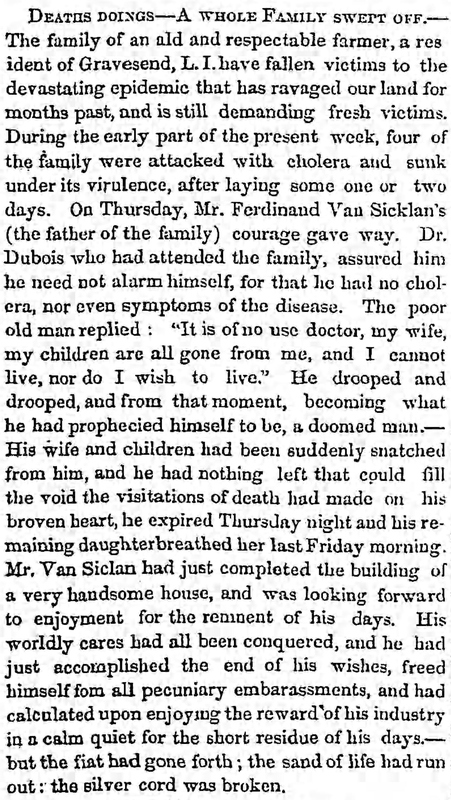 Or Mathias Derby and his mother, Emelie, who died of scarlet fever two days apart in November 1895. And Richard Samuel Vanderbilt, who expired a week after catching a heavy cold at his son Richard’s funeral on January 30, 1919. 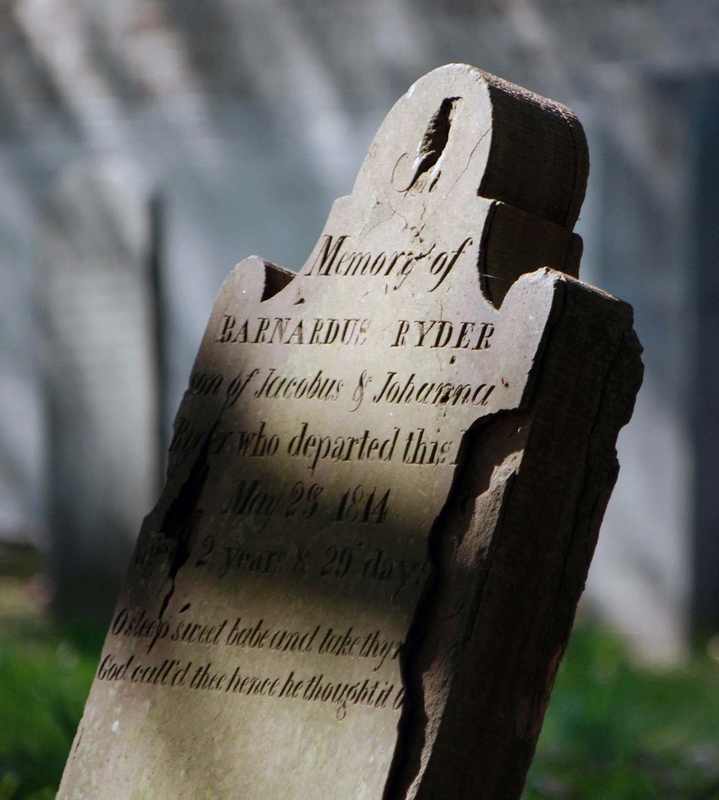 Ida Voorhies, widow of Jacobus, died during her husband’s funeral on October 6, 1831, though whether from the “prevailing fever” that killed her husband, or from grief, is lost to time. His widow, Johanna, never remarried. 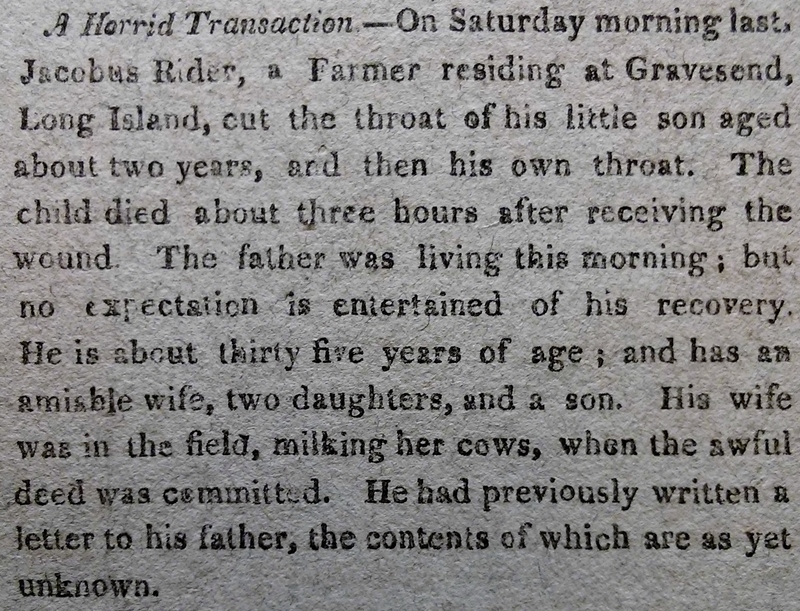 She lived another 33 years, and died at age 65 on August 7, 1847. She is buried near Jacobus and Barnardus, and another infant son, William, who was born in 1804 and died in 1805, long before their family’s tragedy. The other children — Femmetie (1802-? ), Johanna (1807-1894), and a second William (1809-?) — presumably all outlived their mother. They almost certainly did not hand down the terrible memories of 1814 to their descendants. May they rest in peace.